Michael Dourson, President Trump's nominee to lead U.S. EPA's chemicals program, has withdrawn from consideration amid bipartisan concerns about his background. "My staunch objections to Dr. Dourson's nomination were never a matter of partisanship," Sen. Tom Carper (D-Del. ), the ranking member on the Environment and Public Works Committee, said in a statement. "I sincerely believe he is the wrong person to hold this important position," said Carper, "and it's become clear that, even with a Republican majority in the Senate, he could not be confirmed." Bloomberg first reported the news, citing an unnamed administration official. EPA did not respond to a request for comment in time for publication. Environmental groups — including the Environmental Defense Fund, Center for Environmental Health and League of Conservation Voters — opposed Dourson because of his deep ties to the chemical industry. Through his former nonprofit, Toxicology Excellence for Risk Assessment, he often produced industry-funded studies that downplayed the dangers of certain substances, said critics. He would later do similar work at the University of Cincinnati College of Medicine. 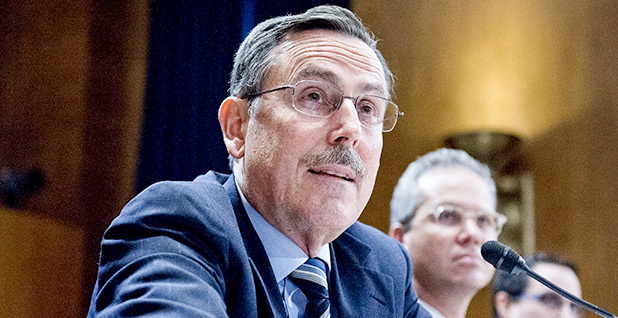 Dourson's path to confirmation as head of the Office of Chemical Safety and Pollution Prevention was perilous and got bleaker this week. All 48 Senate Democrats opposed him, along with North Carolina Republican Sens. Richard Burr and Thom Tillis. Other GOP members had also expressed concerns about his assistant administrator bid. And Democrat Doug Jones' Senate victory in Alabama was another nail in the coffin for the nominee. It's now unclear what will happen to Dourson, who left his university position to advise EPA Administrator Scott Pruitt in mid-October. Sen. Jim Inhofe (R-Okla.) dismissed concerns that Dourson staying at the agency would violate the Senate's constitutional duty to provide advice and consent on presidential nominees. "I would say that Scott Pruitt and Ryan Jackson should sit down, and I don't mind being in on it, and say 'what should he do?'" he told reporters this afternoon. Jackson is Pruitt's chief of staff and previously held the same title under Inhofe. "I would merely say, if he has talents that they need and they're not going to confirm him, then he ought to go ahead and take a position that does not require confirmation so that they can use his talents," Inhofe added.